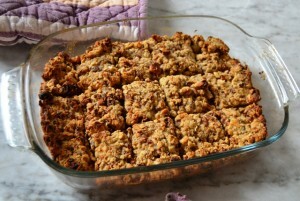 This is the perfect, gluten-free, vegan, easy-to-make energy bar recipe! Let’s be honest, good, healthy energy bar recipes are hard to find, they either contain too much sugar, too many unhealthy ingredients or have a glycemic index that is through the roof. This one meets my standards, it’s even free of yeast and raising agents, two things people are increasingly intolerant to. Eat it for breakfast on the go, as an energizing snack and even as a tasty desert. This brain food is healthy and oh-so tasty! Preheat oven to 350 or 180 celsius. Soak raisins in water over night or for a few minutes in boiling water. Drain raisins and chop. Combine all dry ingredients in one bowl. In a larger bowl mix oil, honey and orange juice. Add raisins, and dry ingredients while mixing. Oil 15 x 20 cm glass casserole and press energy bar batter in. Pre-cut in to squares and bake around 25 minutes. Eat and get satisfied and energized!